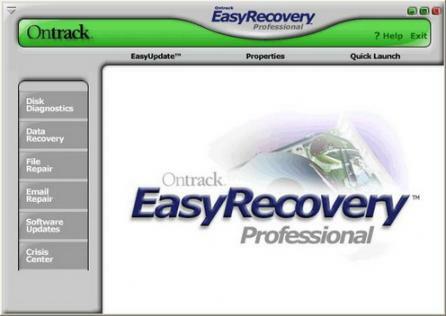 EasyRecovery Professional Standard Edition is a data recovery utility with additional file repair and disk diagnostic tools. EasyRecovery Professional is a software bundle containing EasyRecovery EmailRepair, EasyRecovery DataRecovery and EasyRecovery FileRepair , disk diagnostic tools provided by Data Advisor and advanced data recovery tools and functions. Easyrecovery Professional can recover any type of data and allows previewing recovered files. - Provides advanced solutions for data recovery, file repair and disk diagnostics. - Contains EasyRecovery EmailRepair, EasyRecovery DataRecovery and EasyRecovery FileRepair. - Ontrack Data Advisor and other tools enable superior disk diagnostic. - Has built-in advanced searching options of file types. - Can recover all file types with additional support for raw recovery for more than 290 file types such as document files, MIDI music files, voice files, digital media files…etc. - Enables you to preview files before restoring them, by displaying a file view similar to the one provided by the file’s native application. - 150MB (maximum) of free space for installation only. - Intel Pentium - class processors. - Minimum of 64 MB of RAM (in most cases). - Can only recover 1 file for free.